His tale begins with him swimming up New York’s East River on his way to the UN Building to begin his assignment following Diana. All of a sudden he sees the Amazon Princess fly overhead, riding the air currents and obviously in a hurry. He then sees the reason for her urgency – a gigantic waterspout had appeared as if from nowhere, heading towards the shore. With the crisis over, Wonder Woman departs and Aquaman reaches land, quickly donning some normal clothing so that he can blend into the city’s population. 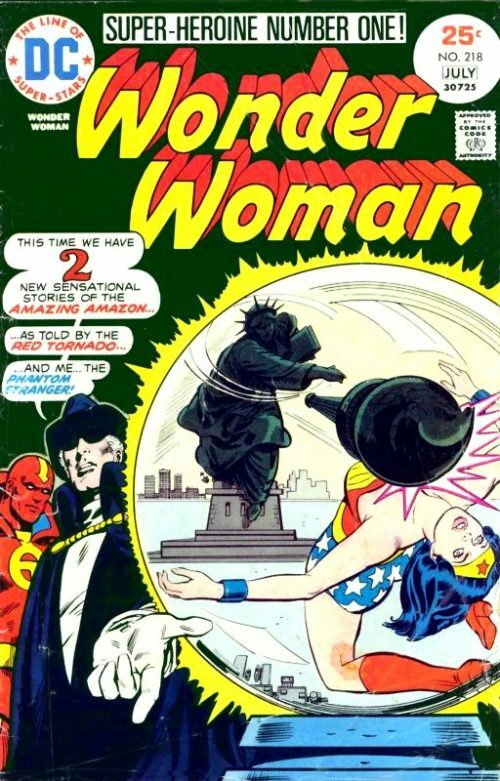 He ponders the strange nature of the freak waterspout and reckons that Wonder Woman is asking herself the same question – who created it? Meanwhile, Diana is transforming back into her normal attire and reports to her boss, Morgan Tracy. As they discuss the day’s affairs, she is preoccupied by the fact that she has been unable to contact Paradise Island using the mental radio for several days. As the two of them are walking along the street, a strange figure lurks in the shadows of a nearby alley. 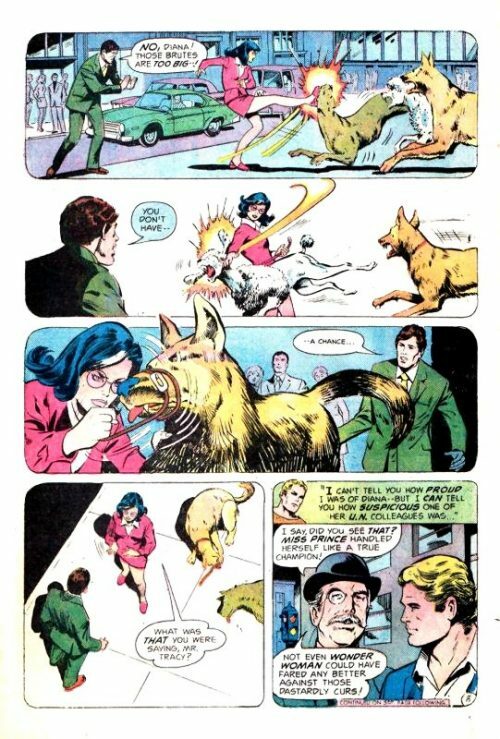 Suddenly, three huge dogs appear from nowhere and lunge at them, but Diana uses her martial arts skill to subdue the dogs, much to the relief of onlookers. 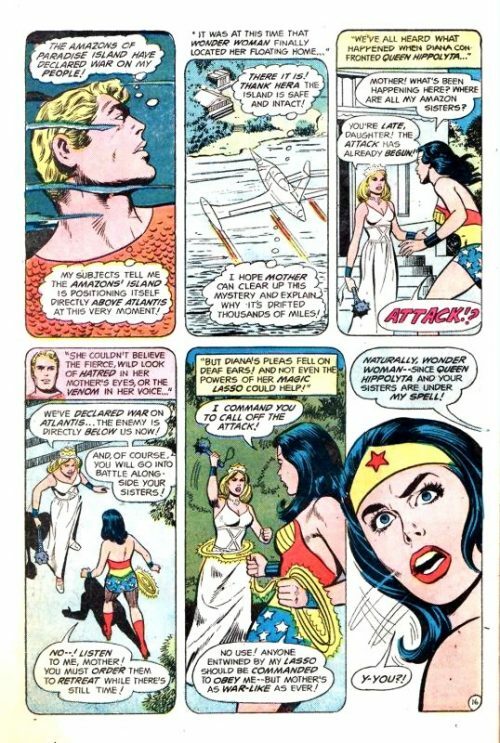 As Aquaman watches, someone in the crowd comments how well Diana handles herself and that Wonder Woman could not have done any better. The man then suggests that Diana and Wonder Woman could be the same person, especially as there seems to be such a striking resemblance. Aquaman replies that if she were really Wonder Woman, she would not risk going into action while still in her civilian identity would she? 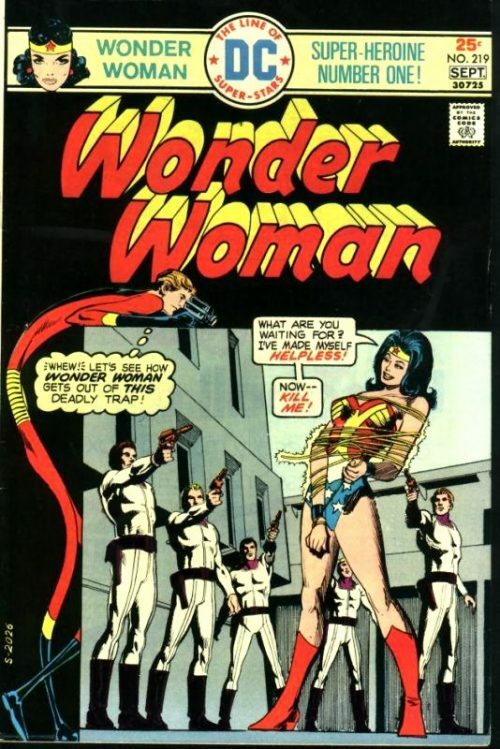 The onlooker reconsiders and agrees that she would pretend to be meek and mild if she were really Wonder Woman, in order not to draw attention to herself. While this conversation has been taking place, the three dogs have become normal size again, wagging their tales like excited pups. Diana surmises that they have been manipulated by the same person who created the waterspout. Meanwhile, unknown to Aquaman at the time, sea creatures in the ocean are trying to telepathically warn him of impending danger at sea, but their attempts to communicate are blocked by the stranger responsible for the waterspout and the dog attack. Back at Diana’s apartment, she tries once again to contact Paradise Island but still has no success. 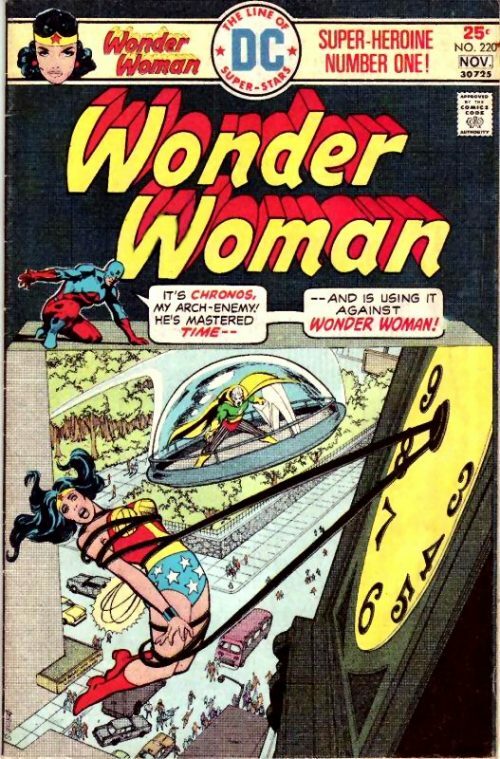 She therefore decides to fly there at once and, as Wonder Woman, leaps onboard her invisible jet. As Aquaman watches, he begins to feel the affects of being out of water for so long and rushes to a nearby water fountain. But just as he tries to scoop up some water, the unseen stranger turns the water into oil, which spurts upwards, hitting the Amazon’s jet. Instantly, the oil then turns to coal, leaving the plane imbedded. Unaware of Aquaman’s predicament below, Wonder Woman uses her lasso to pull the coal mountain and her plane up into the upper atmosphere until the sub zero temperatures leave the coal brittle enough for her to shatter it with one kick. With her plane free at last, she continues on her way. Down below, a group of people are crowding around the weakening Aquaman, unaware that he requires water to revive him. Desperately, he sees his chance and manages to kick a can of soda out of the hands of a nearby kid. Although not pure water, the splashes of soda are enough to help revive him long enough to reach proper water. Thousands of miles away, the invisible jet is fast approaching its destination. But as Wonder Woman clears the cloud cover, she is shocked to discover that Paradise Island is no longer there! Back in New York, Aquaman’s attention is drawn to the faint telepathic cries of a small fish in the sewer. It has made the journey from the open sea in order to relay the urgent message which up until now, has been blocked by the unseen stranger. The message is important enough to spur Aquaman into action and he returns to the sea immediately. 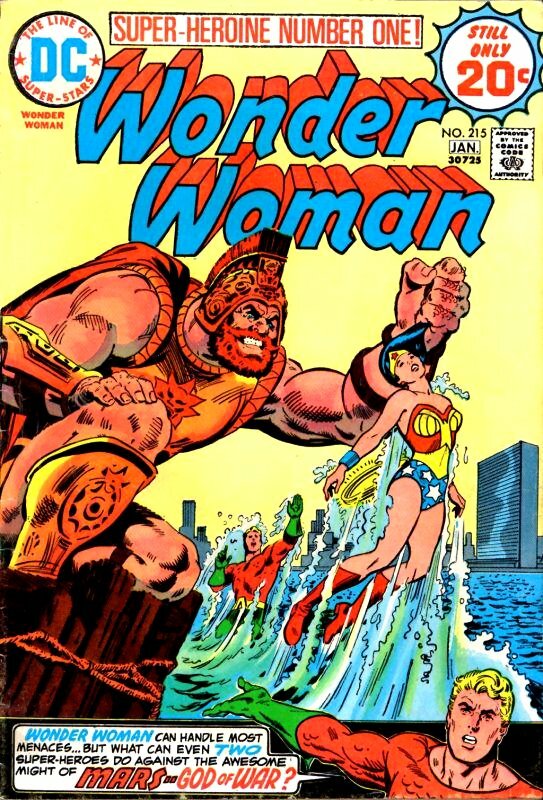 Back with Wonder Woman, and the Amazon Princess is receiving a helping hand from Hera, the most regal of all Greek Goddesses, in order to locate her homeland. Hera tells Diana that although she can lead her to the place in the ocean where she can find the uprooted Paradise Island, she will not be able to provide any more help. The foe that awaits the Amazing Amazon is even feared by the Gods themselves! 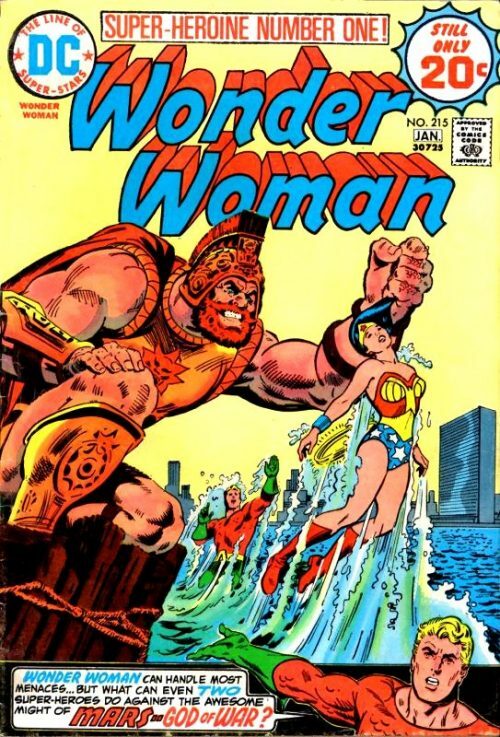 As Aquaman speeds back to the city of Atlantis, his own home under the sea, he sees that the Atlanteans have armed themselves and are preparing to repel an attack by none other than the Amazons of Paradise Island, which even now has positioned itself over the underwater city. 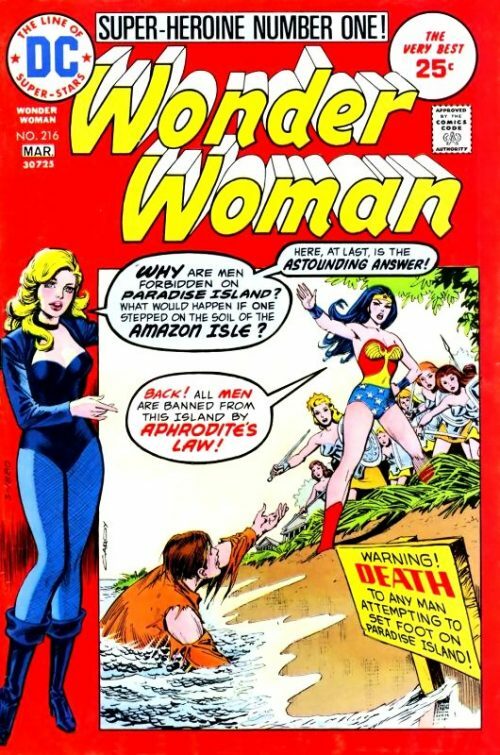 On the Island itself, Wonder Woman has landed and asks her mother what is happening. The queen informs her daughter in a warlike tone that an attack on Atlantis has already begun. 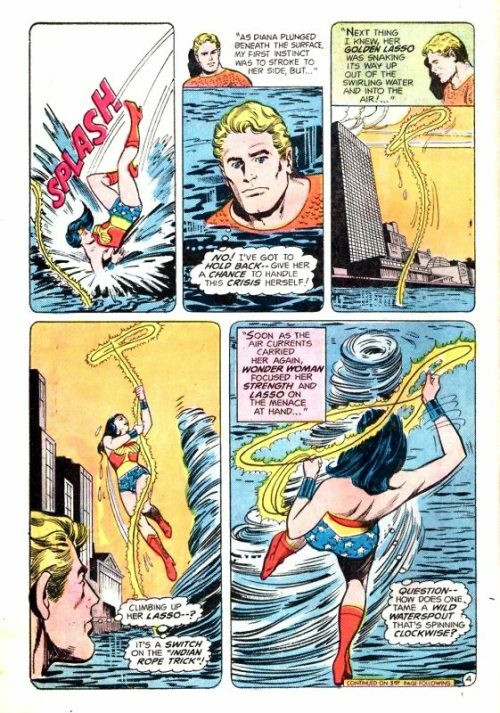 Even when Wonder Woman tries to use her lasso to order her to call the attack off, she is unsuccessful. At that moment, a giant figure reveals himself. It is the stranger, who turns out to be Mars, the God of War, who informs Wonder Woman that Queen Hippolyta and all the other Amazons are under his spell. Wonder Woman then dives into the sea and signals to Aquaman that she has a plan. He uses his telepathic abilities to summon a school of whales to position themselves between the opposing forces while she returns to the Island to confront Mars. She throws herself at him and he, in turn, grabs her as if she were an insect. He begins to crush her in his deathly grip but suddenly he starts to shrink to a normal human size. A surprised Mars wonders why the war below has not recharged his now depleted energies. 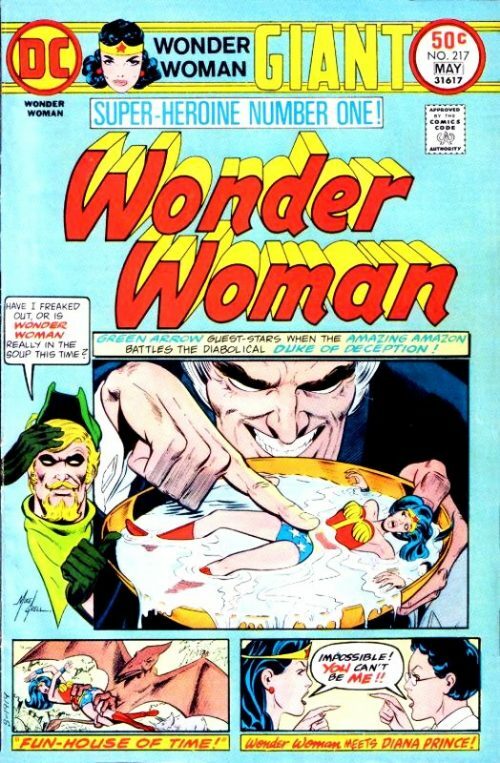 But before he can even react, Wonder Woman fells him with a blow, having gambled that without the battle below to feed his powers, Mars would use the last of it up on trying to kill her – thus leaving him as weak as any other mortal! And so, with Aquaman’s testimony complete, the JLA declare Mars guilty as charged and he is escorted off to a top security interplanetary prison. 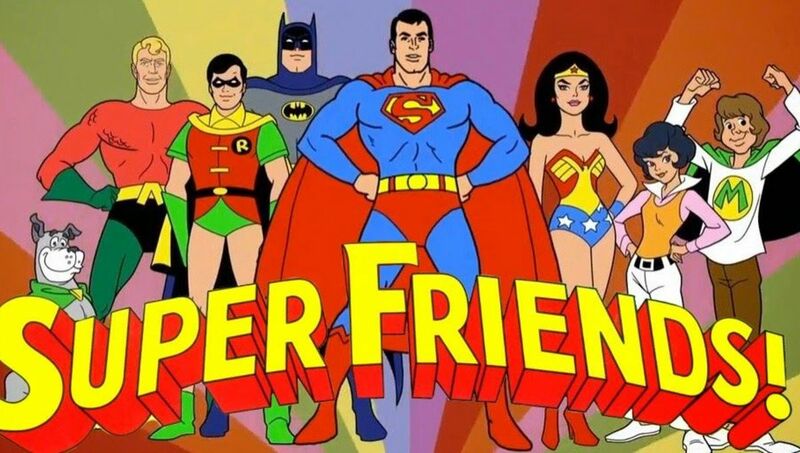 The leaguers congratulate Wonder Woman on another successful trial and ponder who will be next to observe the Amazon’s adventures…. ?